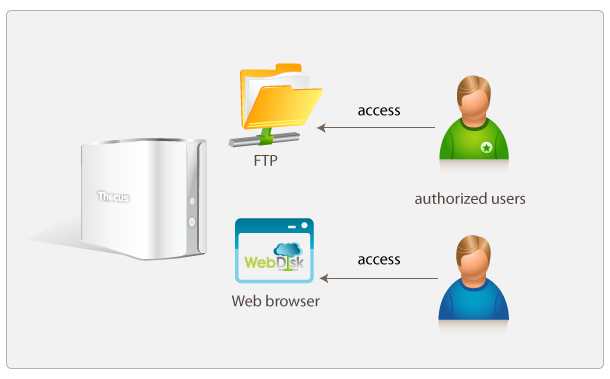 For file sharing, your Thecus® NAS can be set up as an FTP server to allow friends or clients (with an authorized user ID and password) to access your data via FTP software. For example, WebDisk is an excellent way to access the files on your NAS remotely or locally. Once logged in, WebDisk lets authorized users upload files to your NAS, download files from your NAS, and reorganize files and folders within your NAS. Everything is operated from a point-and-click, user-friendly interface that gives you everything you need to manage your files.